UAV drone photography has exploded in popularity over the past two years and what started as a hobby for photography enthusiasts has now turned into a highly beneficial tool for the commercial world. Engineers and construction professionals have embraced the technology, which is now routinely used for gathering and analyzing data from above to aid planning, safety, security and design. As you can see in this example, the images that can now be captured with relatively low-cost and easy-to-maneuver drones and cameras, can provide invaluable information to those on the ground. 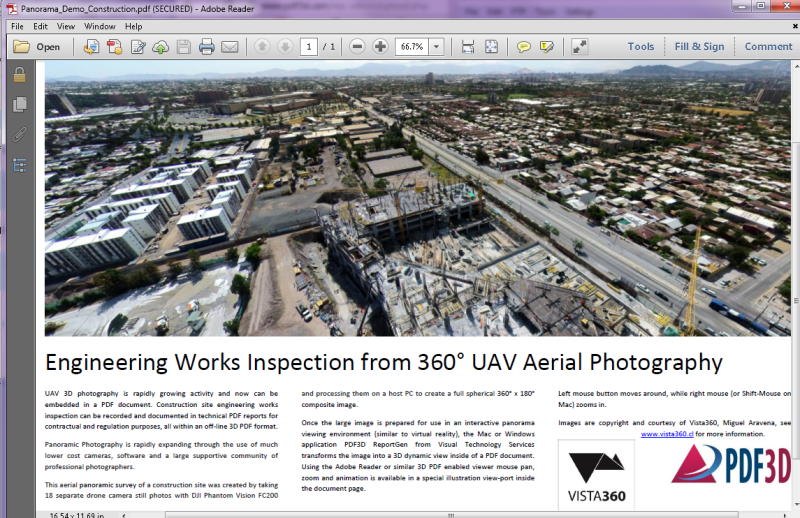 This particular aerial panoramic survey of a construction site was created by taking 18 separate drone camera still photos with DJI Phantom Vision FC200 and processing them on a host PC to create a full spherical 360° x 180° composite image. Image capture is only part of the story, of course. How that image is then used and shared is equally important. In the construction industry, for example, site engineering works inspections need to be recorded and documented in technical PDF reports for contractual and regulation purposes, all within an off-line 3D PDF format. This can easily be done using a tool like ReportGen, which compresses and converts the image to 3D PDF to allow the user or presenter to turn that image into an interactive or animated one that can be shared on a universally accessible platform. It’s a straightforward process: Once the large image has been prepared for use in an interactive panoramic viewing environment (similar to virtual reality), ReportGen then transforms the image into a 3D dynamic view inside of a PDF document. What this gives the user is the ability to embed a fully interactive 3D PDF of the 360-degree image into a report or document for a rich viewing experience. The recipient of the report or PDF can explore the 3D image from many perspectives. They can zoom, rotate, pan or play a sequenced animation using a special illustration view-port inside the document page (which can be accessed automatically by anyone with the free Adobe Reader which often comes as standard with most computers). The fields of construction, engineering and geoscience rely heavily on accessible tools and methods for sharing and communicating highly complex information. With the PDF format, and subsequent tools like PDF3D’s suite of 3D PDF conversion software, developing as fast as the data/image capture technologies, it’s an exciting time for 3D visualization, data sharing and UAV photography.